Our 8-week evening program welcomes first-time entrepreneurs and new founders who are in the idea to prototype phase. You'll learn the essential building blocks needed to expand your idea and validate your vision. Already launched? For early stage startups that already have some traction with revenue, funding or users, Grid110’s 12-week Residency Program delivers layered support based on what you need and where you’re at. LA, let’s do this! We’re building the country’s next entrepreneurial hub right here in DTLA. The area is ripe for innovation, with a collaborative community of startups and uniquely diverse network of technical and creative talent. You’ll get to work side-by-side with fellow entrepreneurs and startups and continue growing more meaningful connections. We know that entrepreneurs are the ultimate risk-takers. That’s why we’re ready to do whatever we can to help you succeed. 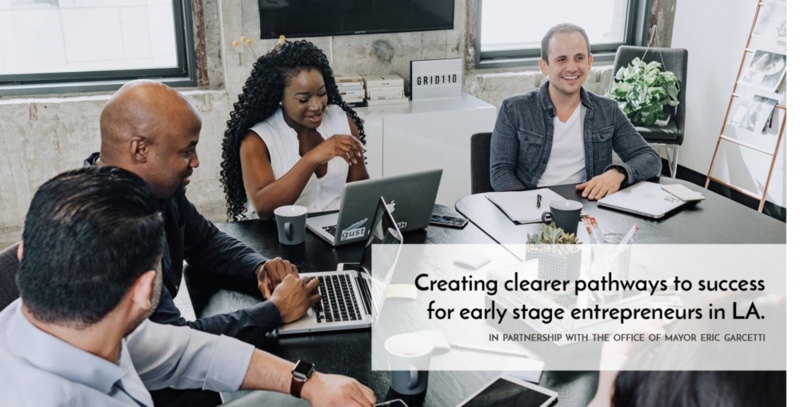 Through educational seminars, 1:1 mentoring, and Grid110’s connections to key players in LA’s innovation ecosystem, you’ll be equipped with the best practices, tools, and resources needed to scale your business. Through our valuable partnerships and a strong commitment to the community, Grid110 is able to provide entrepreneurs and startups with access to some of the best resources that DTLA has to offer. Thanks to our partnership with Cross Campus, we have access to an open, flexible space designed to facilitate interaction, collaboration, and the ongoing exchange of ideas.